This is absolutely one of my favorite times of the year! I love tailgating! Crisp Fall days, football, and the smell of all different kinds of grilled meats filling the air. All I can say is AHHHHHHHHH!!! 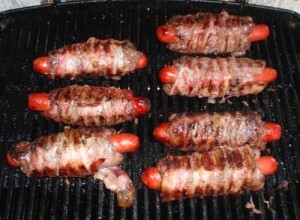 So in honor of tailgaters everywhere, I give you The Bacon Burger Dog! YUM! Combined hamburger, egg and your spices/seasonings to taste and form 8 hamburger patties. Spread out your bacon with every two slices being about 2 " apart. Slice each hot dog from end to end, NOT completely through, maybe half through the thickness of the dog and insert one half slice of the cheese into each dog. Place the dog on one end of the hamburger patty and carefully roll the dog while wrapping it with the patty. Read More to get the rest of the recipe. Place this carefully at the ends of your bacon, which should be spaced 2 " apart....(2 slices of bacon per burger-dog), carefully roll and wrap the bacon. Secure bacon to each burger-dog with two toothpicks. NOTE: Leave each toothpick exposed on one side or the other in order to remove them after cooking. Place burger dogs back onto grill for browning. Serve with any condiments by itself or on a large Hoagie Roll - Awesome!! !